So many reviews of August's Nashville Ryman concerts at the Grand Ol' Opry and the new "Prairie Wind" CD. Here's a small sampling of commentary and analysis. "A lanky man in an antique-style pewter-gray suit and a gaucho hat stood onstage tonight at Ryman Auditorium, the hallowed country-music landmark that was the longtime home of the Grand Ole Opry. An old-fashioned painted backdrop was behind him; an old guitar was in his hands. The guitar, he told the audience, had belonged to Hank Williams, who was fired from the Grand Ole Opry in 1952. Neil Young, the man holding the guitar, said he was happy that Williams's guitar was returning to the Ryman stage. And then he sang "This Old Guitar," a quietly touching song from his coming album, "Prairie Wind," that observes, "This old guitar ain't mine to keep/It's mine to play for a while." Tonight Mr. Young began a two-night stand at the Ryman Auditorium that was a tangle of new and old, of remembrance and reinvention. With him were more than two dozen musicians: a band, backup singers (including his wife, Pegi), a horn section, a string section, the Fisk University Jubilee Singers and Emmylou Harris. They were assembled for what would be the only performances of all the songs on "Prairie Wind" (Reprise), due for release on Sept. 20. The musicians were costumed like old-time country performers, in suits and modest coordinated dresses, but they weren't playing old-time country music." "At times, more than 35 performers crowded the stage, including members of the Fisk University Jubilee Singers and the Nashville String Machine. The result was a concert that alternately resembled a hoedown, a picking party and - during the questioning spiritual number, "When God Made Me" - a church service." "There was so much to these shows. They were rich in music, personality, and meaning, with brilliant new songs, revealing versions of the old ones, terrific and numerous musicians, all swirling around Neil Young at his most inspired. 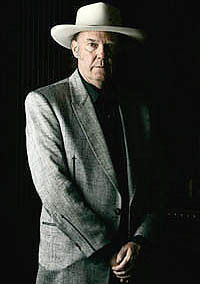 As with the best of Young's music and performances, there were any number of themes both to the new album and the shows. Even though I believe in trusting the art and not the artist, I come back to the autobiographical, not as a way to capture the shows or reduce their meaning, but because in that way they're immediately explosive and then continually unfolding." Capturing live performances on film or tape is a challenging endeavor. With Young and his backing musicians providing a flawless performance, there were no retakes whatsoever during the concert. Aside from a brief pause between songs to reload film in the cameras, it was a remarkable evening -- both from a musical and technical standpoint. Maybe the environment of the Ryman Auditorium played a role in bringing out the best in everybody, including the musicians, film crew and the audience. "I know it's a church," Young said. "I think it's a church of all kinds." "By drawing so consciously on his past, from the influence of country music and rock 'n' roll to that of his family and homeland, Young seemed acutely aware that he will turn 60 on Nov. 12. During the concert, he cited several family members and friends who'd recently passed away. "We're getting to the age where some of us start losing our parents," he said, noting that his father fought dementia at the end of his life. The haunting, jagged title song begins with the line, "Trying to remember what my Daddy said/ Before too much time took away his head." He also referred repeatedly to the late singer Nicolette Larson, who recorded the hits "Lotta Love" and "Comes a Time" with Young and who died in 1997 of a buildup of fluid on the brain. Young also paid tribute to Vassar Clements, a famed hillbilly jazz fiddler who died Aug. 16 in Nashville, and Rufus Thibodeaux, a Cajun fiddler who died Aug. 12 and who had played on the "Comes a Time" album. Later, he addressed other issues close to home. "I'm an empty nester," he said in introducing "Here for You," an openhearted letter to his grown children. "I never knew what that meant until I felt it." Young spoke of how he's written love songs all of his career, "songs for those young gals, dreaming about them and falling in love with them. But this one here, it's a different type of love song." He also repeatedly referenced dreams and memories, from the opening song, "The Painter," which says, "If you follow every dream, you might get lost," to "It's a Dream," about youthful recollections of rural Canada. "Far From Home," a cheerful midtempo tune powered by the three-piece Memphis Horns, recalls a childhood experience of listening to his father singing accompanied by an uncle and a cousin." "I was absolutely knocked out by the new songs. Wow. On many levels they tug at one's heart, bring to mind those that are no longer here, they really touched me. Instrumentation was interesting, melodies really nice and lyrics thoughtful for the most part. As soon as they finished, I wanted to hear it again. This record is going to be downright GREAT! Neil looked spiffy in a silver outfit with cowboy boots; he changed into a lavender outfit for the second set." "My favourite guitar in the world is Willie Nelson's. I've been doin' Farm Aid for 20 years now, he's really someone to look up to. When Hank Williams was here in 1951 he offended some people and was asked not to come back. About 35 years ago I was lucky enough to buy Hank's guitar from Tuck Taylor. This is Hank's guitar [he points to the guitar]. I try to do the right thing with the guitar. You don't want to stink with Hank's guitar. I lent it to Bob Dylan for a while. He didn't have a tour bus so I lent him mine and I left the guitar on the bed with a note saying Hank's guitar is back there. He used it for a couple of months." Also, read a concert review from August 18-19, 2005: "A Prairie Wind Blows Through Nashville" by a fan named Karen Schwarz. 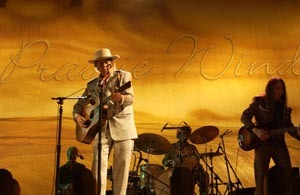 More on Neil Young's new "Prairie Wind" CD and reviews of the Ryman concerts.